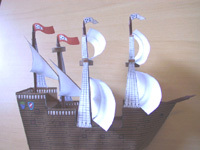 This is the Portuguese ship (caravela or nau) that Pedro Alvares Cabral used to travel from Portugal to India in 1500. During this travel Brazil was discovered. With some little changes it turned to a pirate ship. See all the pictures carefully, before assembling. 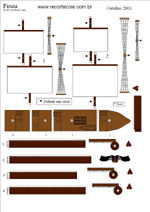 One click to download CARAVELA.PDF file (193Kb). 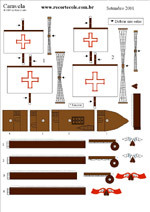 Click to download a pirate ship (179Kb). You will need Acrobat Reader to open these PDF files. If you don't have it, click below to download it freely from Adobe site.